"Justice Brewer" redirects here. For other uses, see Justice Brewer (disambiguation). David Josiah Brewer (June 20, 1837 – March 28, 1910) was an American jurist and an Associate Justice of the US Supreme Court for 20 years. Brewer was born to Emilia Field Brewer and Rev. Josiah Brewer, who at the time of his birth were running a school for Greeks in Smyrna, Ottoman Empire; Emilia Brewer's brother Stephen Johnson Field, a future Supreme Court colleague of Brewer, was living with the couple at the time. His parents returned to the United States in 1838 and settled in Connecticut. Brewer attended college at Wesleyan University (1851–1854), where he was a member of the Mystical 7 Society, and he afterward attended Yale College, graduating Phi Beta Kappa in 1856. While at Yale, Brewer was a classmate of Chauncey Depew and Henry Billings Brown, and was "greatly influenced by the political scientist-protestant minister Theodore Dwight Woolsey." After graduation, Brewer read law for one year in the office of his uncle David Dudley Field, then enrolled at Albany Law School in Albany, New York, graduating in 1858. Upon graduating from law school, Brewer moved to Kansas City, Missouri and after attempting to start a law practice, left for Colorado in search of gold, returning empty-handed in 1859 to nearby Leavenworth, Kansas. He was named Commissioner of the Federal Circuit Court in Leavenworth in 1861. He left that court to become a judge to the Probate and Criminal Courts in Leavenworth in 1862, and then changed courts again to become a judge to the First Judicial District of Kansas in 1865. He left that position in 1869 and became city attorney of Leavenworth. He was then elected to the Kansas Supreme Court in 1870, where he served for 14 years. On March 25, 1884, Brewer was nominated by President Chester A. Arthur to the United States circuit court for the Eighth Circuit, to a seat vacated by George Washington McCrary. This court later became the United States Court of Appeals for the Eighth Circuit. Brewer was confirmed by the United States Senate on March 31, and received commission the same day. 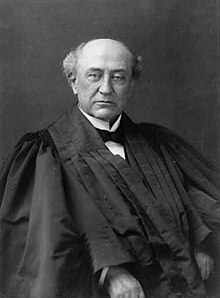 After 28 years on the bench, Brewer was nominated by Benjamin Harrison to the United States Supreme Court on December 4, 1889, to a seat vacated by Stanley Matthews. Brewer was confirmed by the Senate on December 18, and received commission the same day, joining a court that included S. J. Field, his uncle. He served on the court for 20 years, until his death in 1910. In this regard, University of Texas professor and Supreme Court historian Lucas Powe has noted: "Brewer was one of the most influential justices [on] the court at the time. He was a vigorous defender of minority rights. In one case, he argued for stronger labor protections for women, while in other opinions he argued passionately for the rights of marginalized Chinese and Japanese immigrants." Brewer was an active member of the Supreme Court, writing often in both concurring and dissenting opinions. He was a major contributor to the doctrine of substantive due process, arguing that certain activities are entirely outside government control. In his time he frequently sided with the Court's majorities that struck down property rights restrictions. While Justice Brewer's decision was not a binding legal pronouncement reflecting an official acceptance of Christianity and did not say that its laws or policies should reflect solely Christian concerns and beliefs, he did outline the influence Christianity had on the history and culture of the United States. It was this influence that caused Brewer to state many times that this is a Christian nation. Brewer temporarily took a leave from his Supreme Court duties to serve as president of the U.S. Commission on the Boundary Between Venezuela and British Guiana, established by Congress to arbitrate in the Venezuela Crisis of 1895. Brewer was the author of the unanimous opinion of the Court in Muller v. Oregon (1908) in support of a law restricting working hours for women. He was also the author of In re Debs, upholding federal injunctions to suppress labor strikes. Along with Justice Harlan, Brewer dissented in Giles v. Harris (1903), a case challenging grandfather clauses as applied to voting rolls. Due to the unexpected death of his daughter, Brewer left for his Leavenworth home on the day that Plessy v. Ferguson was argued before the Court, and did not participate in that decision. However, "[a]s a judge in Reconstruction era Kansas, he had authored one of the first judicial opinions upholding the right of an African-American citizen to vote in a general election, and as the superintendent of schools in Leavenworth, he had helped establish the first schools for blacks in the state." In 1904, he served as president of the Universal Congress of Lawyers and Jurists held in conjunction with that year's Louisiana Purchase Exposition. In 1906, Brewer was one of the 30 founding members of the Simplified Spelling Board, founded by Andrew Carnegie to make English easier to learn and understand through changes in the English language. Data drawn in part from the Supreme Court Historical Society and the Oyez Project. David Josiah Brewer at the Biographical Directory of Federal Judges, a public domain publication of the Federal Judicial Center. ^ "Supreme Court Justices Who Are Phi Beta Kappa Members" (PDF). Phi Beta Kappa. Retrieved 2009-10-04. ^ David Josiah Brewer; Edward Archibald Allen; William Schuyler. "The World's best orations: from the earliest period to the present time". Books.google.com. p. 9. Retrieved 2016-08-28. ^ "David Josiah Brewer". Robinsonlibrary.com. Retrieved 2016-08-28. ^ "News & latest headlines from AOL". Aolnews.com. Archived from the original on 2012-10-05. Retrieved 2016-08-28. ^ "Thepolitical Philosophy Of Supreme Court" (PDF). Libinfo.uark.edu. Retrieved 2016-08-28. ^ "David Josiah Brewer - Further Readings - Court, Rights, United, and Kansas - JRank Articles". Law.jrank.org. 1910-03-28. Retrieved 2016-08-28. ^ "Plessy V. Ferguson | Findlaw". Caselaw.lp.findlaw.com. Retrieved 2016-08-28. ^ Hylton, J. Gordon (Fall 1991). "The Judge Who Abstained in Plessy: Justice David Josiah Brewer and the Problem of Race". Mississippi Law Journal. Mississippi Bar Association. 61: 315. ^ "Article: The Judge Who Abstained In Plessy v. Ferguson: Justice David Brewer And The Problem Of Race". Litigation-essentials.lexisnexis.com. Retrieved 2016-08-28. ^ "Carnegie Assaults the Spelling Bee". The New York Times. March 12, 1906. Retrieved 2009-08-28. Wikimedia Commons has media related to David Josiah Brewer.